So I joined my blogger friends on Saturday to try out this new Indian Restaurant along Circumferential Road here in Davao. It’s interesting to note that this once a secondary road, then rarely traversed is fast becoming a diverse, sought-after food strip in the city with now several restaurants open for trying. 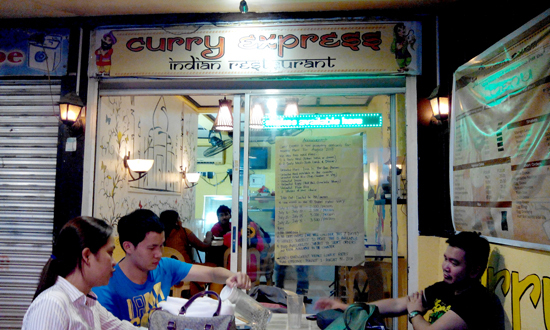 Curry Express is one welcome addition to the list of must-try food stalls along this belt. 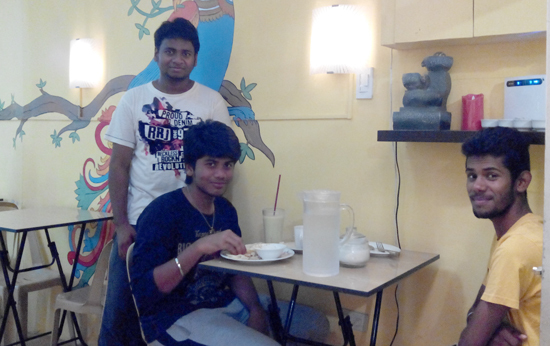 It offers sensible Indian Cuisine in an inexpensive, unpretentious and homey atmosphere. Curry Express is more like your favourite eatery with no flair rules of fine dining whatsoever. But don’t get the wrong impression about its simplicity; its food surely has hit the right fiery flavours down to every morsel of their dish. And for someone who is not so used to intense spiciness, (geezzz, shame on me) has devoured hearty helpings and was left sweating and panting asking for more ice cubes on my soda. 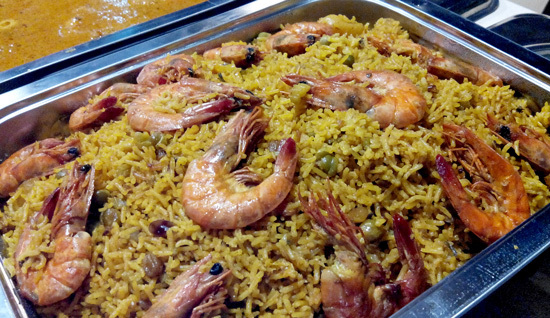 Shrimp Biryani. I enjoyed this dish as it’s not as hot as I thought it would be. This traditional Basmati rice-based dish is packed with easy-going zing, enough for me to keep digging for another serving. You can opt for Chicken Biryani at P160 for full order and P65 for half order. Talk about value for money! Highly Recommended! 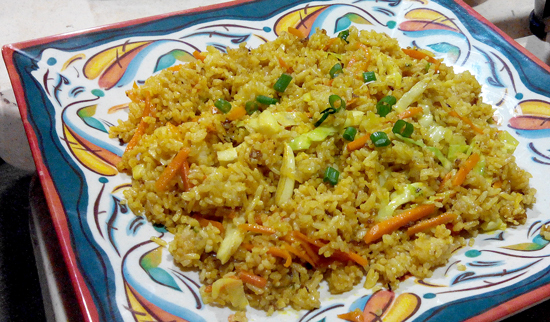 Indian Vegetable Fried Rice. Your all-time favourite fried rice cooked in a mild spicy twist. How’s that for breakfast? And this is the best part, full order (good for one hearty eater) is at P50 and half order is at P25. Thought might be your awesome Indian breakfast along this strip, must try! 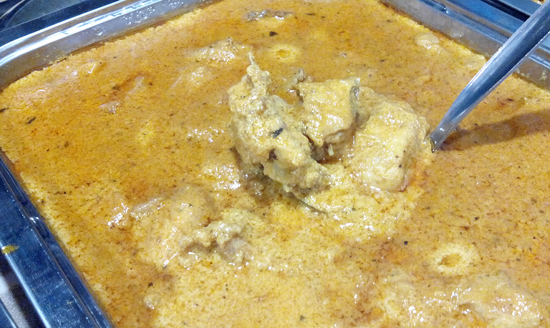 Express Chicken Curry. Probably the most popular of all Indian dishes among Pinoys. I do my tame adaptation of this dish too at home sometimes, but nothing beats a version all messed up with a whole lot of authentic Indian spice essentials. Don’t leave this place without trying this dish! Chicken 65. However the name of this dish originated I’ll leave that idea to you open for Googling. 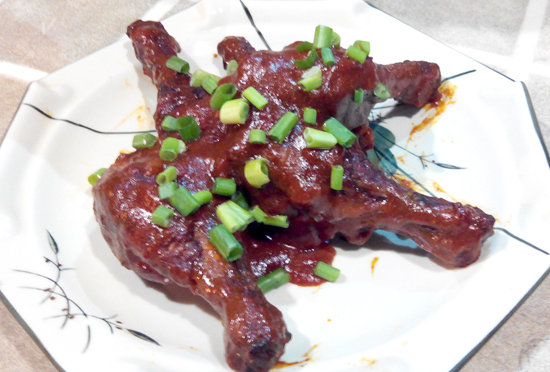 But one thing is certain, this deep-fried chicken in red chili coat is a surefire hit! This is perfect for chill out night and a bucket of iced-cold beer on the side. Chili Chicken. This is India’s version of sweet and spicy chicken. 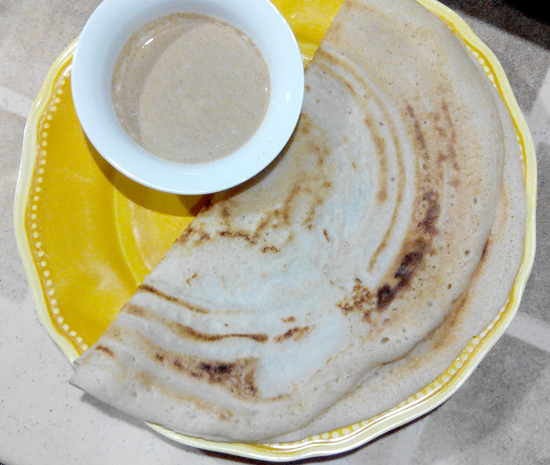 Spiced and sweetened just right, thought it suits every Pinoys discerning palates too. Had it without reservations. And it was everyone's bet. So good! 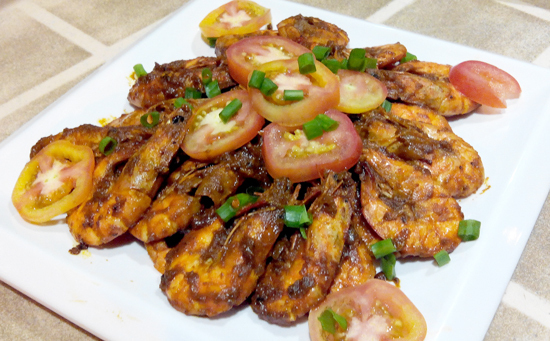 Shrimp Masala. This seafood goodness is layered with just the right amount of Indian spice mix. Anyone who would want to have a taste of India can put up with the level of its spiciness. Also a highly recommended order! 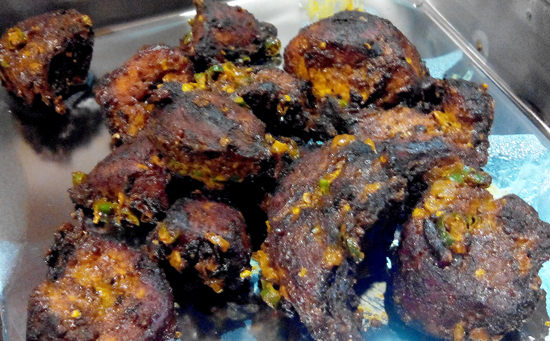 Aloo Bonda is a traditional Indian deep fried potato balls made with spicy potato mix. It may look firm on the outside but it’s actually soft and flavourful in the inside. Have a plateful of this too! 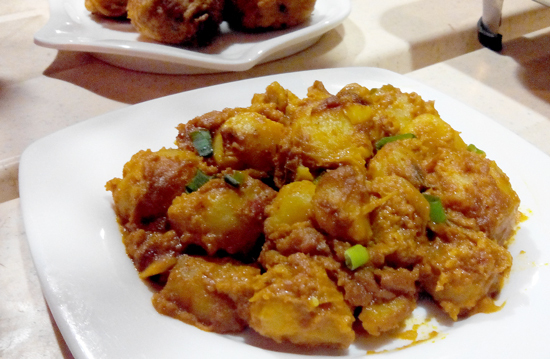 Potato Masala. This dish got me fanning my mouth like .... haaaaaahhh! 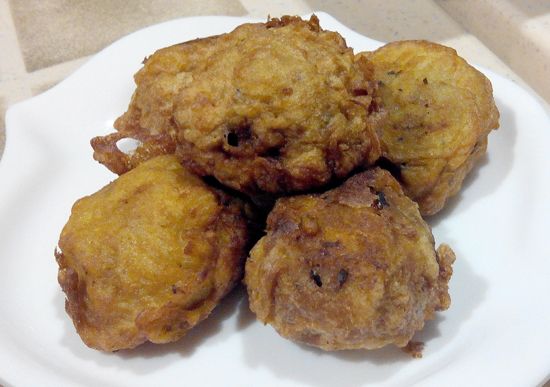 It’s made of a well-done potato cooked with a sauce, as in with a variety of spices in a sauce. Forking a piece had my spice gauge kicked several notches up. That kind of hotness I can feel it stock at the roof of my mouth and I can feel my ear smoking. Want this Indian food experience too? (without prim people judging around you?) Then, this is the place to be. Few words of caution: Always have an iced-cold water or beer or soda ready! Egg Dosa. This is an Indian staple made out of rice batter. This serving comes with a small bowl of peanut chutney. Just what I need to cut the spiciness out of my hot mouth. Love it! 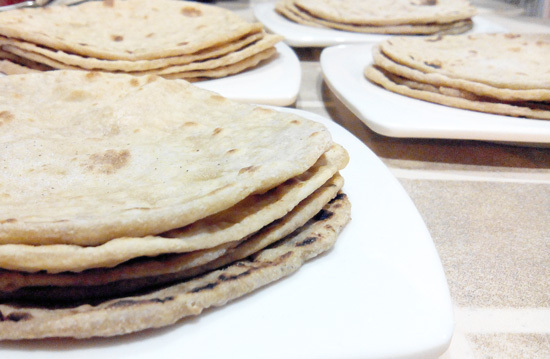 Chapati is another Indian staple. It’s an unleavened flatbread that is a perfect complement to the above-mentioned dishes. Each is at P10. What’s an Indian Restaurant without Indians! With the growing number of Indian Medical Students staying around the vicinity, Curry Express has responded to this market and now has a number of Indian 'casera’. They’re friendly dude smiling for me during their dinner. Notice that they really eat with their hands. 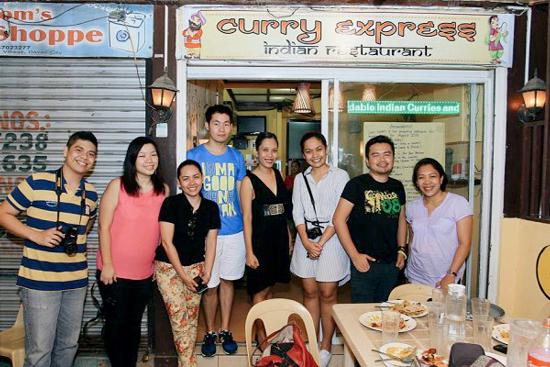 Davao Bloggers after a hearty Indian food experience. Thank you Curry Express for having us. Curry Express is owned and managed by Michelle Golajer (Lady in black, fourth from right) She retired from her corporate job at 27 and mustered the courage to put up this restaurant where she also cooks some of the dishes on a daily basis. It was a delight hearing her share her hilarious cultural encounters with the Indians, mostly students, that frequent her restaurant. Despite cultural differences she knows that food knows no boundaries and made it a point to prepare quality food for her patrons. Michelle’s love for Indian food has given her a good edge of the market and now has regular customers coming, not only Indians, but Pinoys who loves Indian dining as well .